"I am so happy to see you now have a fancy script font. I have seen them in our local boutiques. 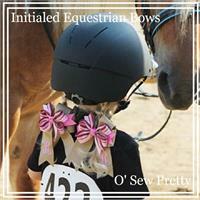 But they are so expensive, and your bows are so much better! 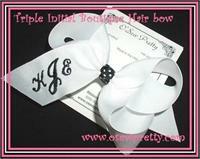 Another great way to personalize your bows! THREE GREAT SIZES! 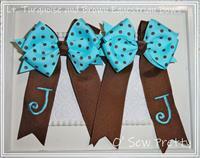 Another great way to personalize your Bow Dangle Equestrian Hair bows! 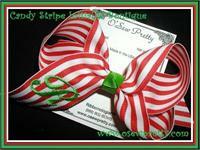 How sweet is this monogrammed Candy Cane Stripe Hair bow! 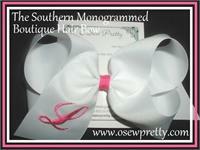 Your Child can really show their individuality with our Southern style Monogrammed Boutique Hair bow! If Bling is her thing ! 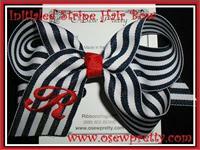 Then this is the hair bow for her. 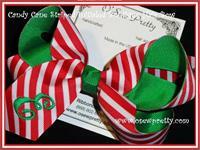 Another O' Sew Pretty Original and a wonderful way to jazz up any outfit. 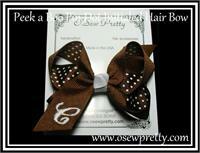 Shown in Brown and white but available in 21 Pin Dot colors and tons of thread options. 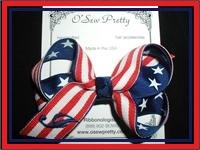 Featured on our boutique style bow, this monogrammed hair bow is available in 3 hair bow sizes and your choice of a 2 or 3 letter monogram in countless colors. NOW AVAILABLE IN THREE SIZES AND MORE ACCENT COLOR OPTION. 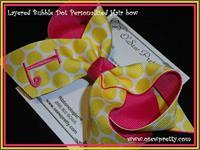 Your Child can really show their individuality with our Monogrammed Boutique Hair bow! 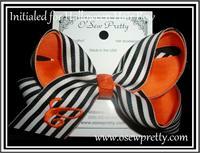 A stacked boutique hair bow that you design to coordinate with her special outfit. 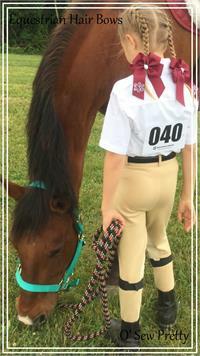 It's extra special with a monogram in elegant script lettering! 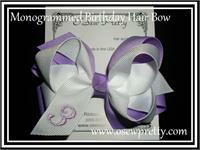 Seven hair bow sizes. 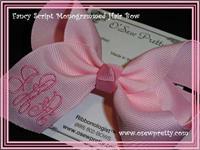 How sweet is this monogrammed Hair bow! 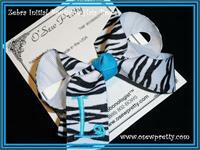 Animal print ribbon is all the rage, choose just the right print for her trip to the Zoo!. 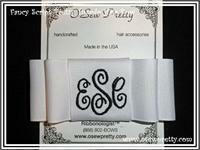 It's extra special with a monogram in elegant fancy script lettering! 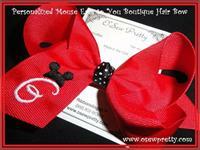 Three hair bow sizes. It's extra special with a monogram in elegant fancy script lettering ! 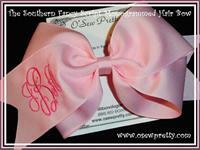 A three letter Fancy monogram on our largest boutique style hair bow, made from 2 1/2" ribbon. 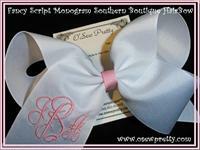 It's extra special with a monogram in elegant fancy script lettering! A wonderful way to jazz up any outfit. 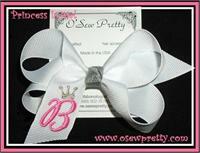 Shown in Grey and white with light pink Initial but available in 24 Pin Dot colors and tons of thread options. Layered for extra color pizzazz! A great option for cheer teams. 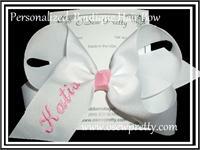 Another great way to personalize your Hair bows!